Trail from regime’s thugs leads back to ally and dictator-for-life, Hun Sen of Cambodia. Late last night, after Thais across the nation celebrated Father’s Day, armed thugs attacked several anti-regime protesters near the currently occupied Ministry of Finance. They rode motorcycles, fired guns, and threw explosives. There were several injuries, including one protester losing his arm. Protest leaders demanded the regime investigate the incident, and have only been met by silent complicity. 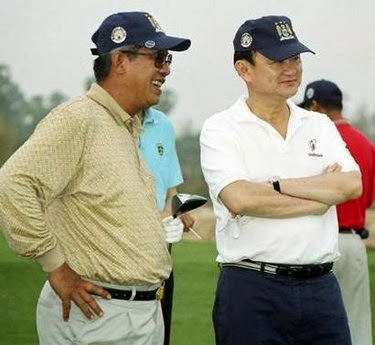 Image: Cambodian dictator-for-life Hun Sen (left) stands next to deposed dictator of Thailand, Thaksin Shinawatra (right), during a round of golf. Cambodia has provided sanctuary for Thaksin’s most extreme political allies, and served as a base of operations form which to destabilize neighboring Thailand. Hun Sen even went as far as officially appointing Thaksin as Cambodia’s “adviser on economics” to bolster his sagging legitimacy. While Thaksin is widely believed to be in exile in Dubai, he divides at least part of his time staying in Cambodia. With militants and thugs from Cambodia turning up behind violence targeting anti-regime protesters, the trail of slime leads to Hun Sen and Thaksin’s door. With the capture of 5 Cambodians attempting to commit arson, admitting that they were hired to do so, it exposes what might be just the leading edge of a large campaign of violence being organized by the regime. The regime’s ties to the neighboring dictatorship of Hun Sen of Cambodia are well known within Thailand, however little, if ever covered by the Western press. Cambodia is ruled by dictator-for-life Hun Sen, who has been in office since 1985, and re consolidated his despotic grip on power in 1997 after a bloody military coup that saw his opponents either killed or exiled. Those who failed to flee, according to Human Rights Watch, were brutally tortured and murdered. Since then, he has presided over a tragically failed state, the victim of the Khmer Rouge, of whom Hun Sen was a participating member, and since then squatted upon by his regime and a large collection of foreign backers. Almost half of Cambodia has been sold to foreign speculators in the past 18 months – and hundreds of thousands who fled the Khmer Rouge are homeless once more. While the US’ training of Cambodian troops in and of itself does not directly indicate a conspiracy, it positions the US military well for any current or future operations that may be undertaken in support of the US-backed regime in neighboring Thailand. Like Hun Sen, Thaksin has a penchant for mass murder, human exploitation, and a proclivity for serving foreign interests. Unlike Hun Sen however, Thaksin’s opponents are stronger, better organized and still hold firmly in their possession most of Thailand’s indigenous institutions. While foreign interests have helped Thaksin by building up NGOs to augment his regime, these still hold very little sway in Thai society. In addition to harboring members of Thaksin’s political machine, Hun Sen went as far as appointing Thaksin himself as a “government adviser on the economy,” in an attempt to bolster his lack of legitimacy. Before going into exile, Jakrapob told this correspondent that the UDD had clandestinely moved small arms from Cambodia to Thaksin’s supporters in Thailand’s northeastern region, where the exiled premier’s popularity runs strongest. He told other news agencies that the UDD was willing to launch an “armed struggle” to achieve its goals, which included the toppling of the government and restoration of Thaksin’s power. The report went on to describe possible scenarios for an increasingly militarized attempt by Thaksin to eliminate his enemies, a cue assuredly taken from Hun Sen’s bloody exploits. The number of armed supporters Thaksin could possess in Thailand are minimal. 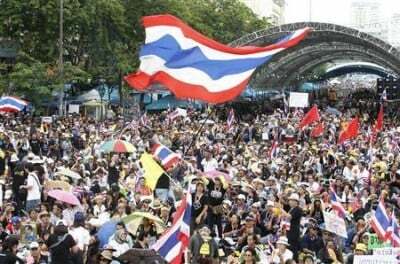 Of the 10,000-30,000 supporters he is able to mobilize with cash payments and bus services at any given time, only about 1,000 could be considered fanatical, and out of that, fewer still who are of military age, willing, and physically able to take up arms against Thaksin’s enemies. Thaksin had clearly augmented this with professional mercenaries, drawn from paramilitary border units in the northeast, but these numbered only about 300 and were easily outmatched by the Thai military in 2010. Thaksin’s grip on the nation’s police forces allows him to produce on demand thousands from across his north and northeast political stronghold, but even if these police were armed, they lack the training, organizational skills, and coordination to pose any threat to the nation’s armed forces. They have proven in recent days to be completely ineffectual against even unarmed protesters. Image: From Thaksin Shinawatra’s “red” publications, left to right – “The Giant Wave of Democracy From Tunisia to Thailand,” “Asking to Die in the Seat of Power,” and “From the Nile to the Mekong, to the Chaopaya,” all indicate that Thaksin’s propagandists were likewise channeling the US State Department’s “Arab Spring” rhetoric as well as making the implicit threat that armed militancy was (and may still be) a desired option. The real threat would be an influx of Cambodian mercenaries, trained, armed, and directed from Cambodia, and sent into Thailand covertly to be staged and deployed at key points during Thaksin’s continued bid to consolidate his power. These could be used to augment police and small units of fanatics drawn from Thaksin’s “red shirt” mob, or in individual operations aimed at various elements of the opposition. This follows the same model Thaksin’s foreign backers are using against Syria, where armed militants had been prepared and staged along Syria’s borders, years before violence erupted in 2011. While initial reports from Western media claimed Syria was engaged in a “civil war,” it is now abundantly clear it was instead a foreign invasion by mercenaries sponsored by a conglomerate of NATO and Persian Gulf nations. The Thai “civil war” Western analysts have long been predicting with poorly masked enthusiasm, would most likely only materialize using the “Syrian-model” of covert invasion combined with a coordinated propaganda campaign carried out by the Western media. Instead of Jordan, Lebanon, Turkey, and northern Iraq feeding militants into Syria, this new war would consist of Cambodia feeding militants and material in through northeast Thailand, with the resulting conflict appearing to be between Thaksin’s political stronghold there and the rest of the country. While the violence would stand little chance of actually defeating Thailand’s formidable military forces, it could serve as useful for securing more overt foreign backing (just as in Syria’s case). By exposing it as a premeditated fraud from the beginning, and comparing it to NATO’s already widely unpopular “covert” intervention in Syria, this option may become altogether distasteful – perhaps enough so to be abandoned entirely. In the wake of NATO’s proxy invasion of Syria, and because Egypt’s establishment initially bent with the force of US State Department-backed protests during the so-called “Arab Spring,” when the Egyptian military decided to finally oust the resulting Western-installed regime, it quickly decapitated the leadership of its main support base, the Muslim Brotherhood, jailing leaders and ransacking its facilities nationwide, while they quickly severed foreign funding to the insidious NGOs constructed to subvert Egyptian sovereignty. Attempts to trigger an armed uprising were quickly extinguished with decisive and unyielding security operations. By “tearing off the band-aid quickly,” Egypt was able to restore order. 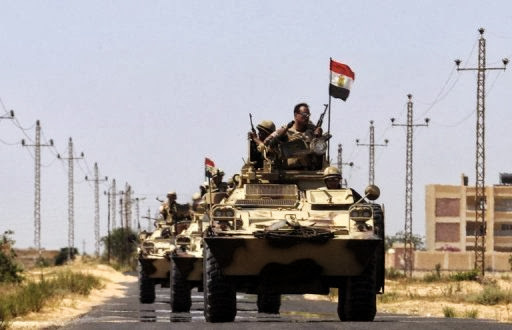 While protests and violence are still present in Egypt, it will never develop into what Syria is now facing, or what Thailand could possibly face.